Fresh is best. Everyone knows it and your taste buds agree. That’s why Colin McGaffin and Lisa Graham ended up making a business out of it. 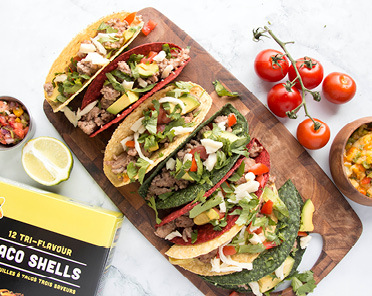 Looking for a healthier lifestyle, the couple started snacking smarter with homemade salsa full of fresh tomatoes, peppers, onions, cilantro, parsley, jalapenos and freshly squeezed lemons and limes back in the ‘90s. Soon known as superstar salsa makers within their circle of friends, Colin and Lisa ventured out to the Kamloops Farmers’ Market to sell salsa in 1999. 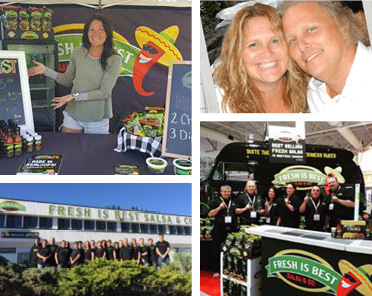 It was so successful that by the end of that same year, Fresh is Best had already opened a retail and production facility. The only problem? You need a darn delicious tortilla chip to complete such a superb salsa. 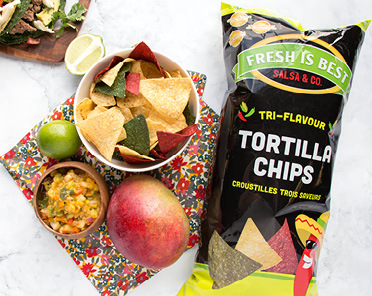 Enter Fresh is Best tortilla chips. The crispiest, freshest and perfect-amount-of-saltiest tortilla chips around. “They just make the greatest pile of nachos ever,” says Tania Kanigan, sales manager at Fresh is Best. Superlatives aside, these are such popular tortilla chips because of the unique tri-flavour bag, Tania tells me over the phone. The yellow chips are traditional corn flavour, the red have a slight chili kick and the green are jalapeno. (Don’t worry if spicy isn’t your thing, all the chips are lightly flavoured with a mild taste). Made in small batches fresh to order, the corn-based chips are also trans-fat and preservative free.